Zones: - Tранспорт и доставка на покупки и пратки от онлайн магазини в Англия до България! We can send to any location in the country with the most popular courier. We can send to any address in the country. A little bit more expensive, but also more convenient service for you. Again you have 20% discount from Econt's tarif. You pay your GGBG fee by cash on delivery. Our GGBG courier will deliver to your address. We love this service as it gives us better connection with you. You could see the prices for the different parts of Sofia below. They don't include a delivery to your floor. If we optimize the time for delivery we will be able to deliver more of your parcels per day. In order to succeed in that we will encourage our clients to meet our colleague to the entrance to the address. Ofcourse we will not refuse a delivery to your door, but this service will be paid additionaly. Delivery to your door - 1 lv. Delivery to your door in a closed complex - 2 lv. 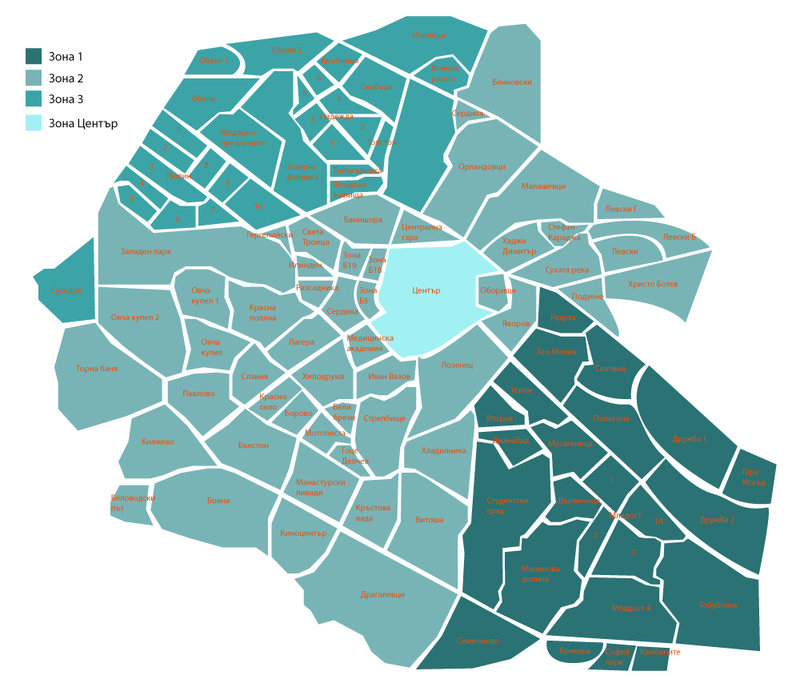 Zone 1 includes districts: Mladost, Sofia park, Kambanite, Malinova dolina, Simeonovo, Druzhba, Poligona, Studentski grad, Dianabad, Slatina, Izgrev, Iztok, Reduta, Geo Milev. Prices: parels up to 3kg. - 2 lv., 3 to 7 kg. - 2.50 lv., 7 kg. or more - 3 lv. + 0.50 lv. for every additional kilogram. Delivery to your door - 1 lv. Delivery to your door in a closed complex - 2 lv. Zone 2 includes districts: Krastova vada, Pavlovo, Buckstone, Dragalevtsi, Orehite, Manastirski livadi, Gotse Delchev, Strelbishte, Ivan Vazov, Lozenets, Borovo, Hipodruma, Belite brezi, Krasno selo, Slavia, Lagera, Ovcha kupel, Krasna polyana, Zapaden park, Gorna banya, Gevgeliyski, Ilinden, Razsadnika, NPZ Sredets, Benkovski, Orlandovtsi, Levski, Hadji Dimitar, Vrazhdebna, Poduene, Hristo Botev, Voenna rampa. Prices: parels up to 3kg. - 3 lv., 3 to 7 kg. - 3.50 lv., 7 kg. or more - 4 lv. + 0.50 lv. for every additional kilogram. Delivery to your door - 1 lv. Delivery to your door in a closed complex - 2 lv. Zone 3 includes districts: Lyulin, Nadezhda, Tolstoy, Zaharna fabrika, Moderno predgradie, Suhodol. Prices: parels up to 3kg. - 4 lv., 3 to 7 kg. - 5 lv., 7 kg. or more - 6 lv. + 0.50 lv for every additional kilogram. Delivery to your door - 1 lv. Delivery to your door in a closed complex - 2 lv. Prices: parels up to 3kg. - 3 lv., 3 to 7 kg. - 4 lv., 7 kg. or more - 5 lv. + 0.50 lv for every additional kilogram. Delivery to your door - 1 lv. Delivery to your door in a closed complex - 2 lv.